Katniss (Jennifer Lawrence) is with the underground rebel movement and is being designed as its leader. Julianne Moore is the rebel president. Alma Coin (Donald Sutherland) is her foe, President Snow of Capitol. Both rebel and Capitol forces attack each other. Katniss invents the mockingjay song as the anthem of revolution. Her friend Peeta from Catching Fire has been brainwashed by the government and he is interviewed by impresario Stanley Tucci. The rebels cut off Capitol’s power and infiltrate it. Will they rescue Peeta? The first book of Hunger Games has been split in two as the franchise takes its cue from the Harry Potter gravy train. 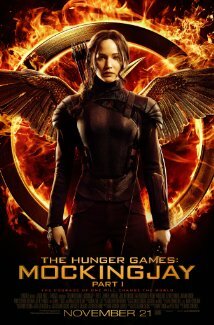 Mockingjay appears to have jettisoned the futurism of the previous films, as decadent nabobs have scrapped the make up for the born again puritan look in boiler suits, and Katniss has settled for teen war chic as (rather approprietely with ironic intentions as to the power of film) she engages in a media image as well as an arms war. Our heroes stroll through the war rubble like world-redeeming rock stars, posing against disaster backdrops as if telling us this is what’s happening right now in some parts of the world. Jennifer Lawrence is a pretty good teen hero model. She has the charisma and the face for it, she is a sci-fi messiah as a feminist riposte to Paul in Dune. The film is going for contemporary relevance not just regarding the horrors of war but also enviromental disaster. Julianne Moore is icily effective as the iron-like president, as she and her team create a charismatic role for Katniss. This, for me, is a canny self acknowledgement of Mockingjay’s own merchandizing power as a franchise, as it fosters luvvie delusions about being spokespersons for the world. It appears to be distancing itself from the other teen franchises too, as it tries to be a thinking person’s Buffy the Vampire Slayer. Why Katniss would love someone as feeble as Peeta is a mystery since she is superior in every way. There is an inescapable aura of sadness in this film because of Philip Seymour Hoffman’s death.. 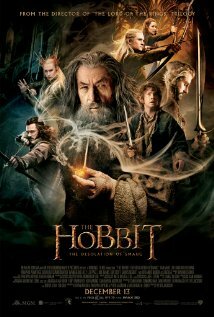 The second Hobbit movie in which Bilbo (Martin Freeman) and the dwarves, led by Thorin Oakenshield (Richard Armitage) try to reclaim their Kingdom of Erebor and its gold from Smaug the dragon. On the way they’re imprisoned by the elves led by Orlando Bloom, and they get to the Kingdom ruled by Stephen Fry. Smaug is voiced by Benedict Cumberbatch. Bilbo must face the dragon. There is no Gollum in this, so we get no eccentricities at a tangent, just different confrontations. The visual effects are spectacular, especially the forest. The obvious thing about making a fantasy film is that you make it appear as unworldly as you can, otherwise it is just actors in fancy dress walking through an everyday forest. You can’t do this if your budget is restricted, but if that is the case maybe it’s better not to do it at all. Peter Jackson of course has a limitless budget. The elves’ kingdom is spindly and cathedral-cavernous, the only permitted tone is portentous and breathy even if you were to read out a supermarket shopping list. The elves talk like they’ve undergone brain removal surgery but the visual distractions compensate. The dwarves escape in barrels rolling down the river then they face the Orcs (who look like rugby players after a white mud bath), but they look scary. The fishing village is peopled with Volvo types and their cute Harry Potter Britishness, so I was glad to get to Erebor and here the visual spectacle is breathtaking (if a little like Indiana Jones and the Temple of Doom magnified). Smaug is somewhat domesticated by familiarity but the scene still holds the attention. Martin Freeman is good as the ordinary hobbit, who could be punching above his weight if he didn’t have that peskily unsporting gold ring with him. The dwarves are all militant rectitude, so shop worn since the glowering antics of the downtrodden, squeezed out any wit in Braveheart and it’s ilk. Their militant hairy rectitude gets a little wearisome. Gandalf’s talent for avoidable danger leads him into the usual perils that we know he can overcome (this plot device ultimately scuppers Harry Potter). Good entertainment. This Spiderman is less of a nerd who has to prove himself and more the victim of a self contempt liberated by his new found powers. He becomes an unaccountable bully seeking revenge, but conceals this to himself by thinking that he pursues justice for the weak. He simply repays the victim in his own coin, to the bully he is a bully, and to the greedy or cynical he is a cynic with superpowers. Garfield’s Parker is much more smitten with his girlfriend than Toby McGuire was with Kirsten Dunst, indeed Garfield’s character goes on being himself with the distraction of arachnid aerobatics. Like Molina’s multi-armed baddie in the McGuire Spiderman film, Curt Connors starts out by wanting to do good but the obsessive Faustian pact with techno power always ends badly. The conception is total, but then there is eleventh hour repentance. Garfield’s Parker also has to learn self knowledge through the use of his powers. I wonder if the writers of these comic books were trying to teach simple lessons about the abuse of American military power in the mid 20th century. Garfield’s Peter Parker is no nerd glancing over his shoulder at comic book purists, he doesn’t do a Clark Kent (the civilian identity of Superman) and pretend to be a decent wimp in order to enhance by contrast the spell of his superpowers. This time the powers are acquired quickly as a fun jaunt that might end any time. The spun webs keep Spiderman from the airy nothing of just flying about, his powers depend on the use of buildings. In Spiderman gravity is aestheticized so it makes his use of space more like a techno circus stunt. He’s a sort of glorified base jumper who recognizess the limits of his powers as enmeshed with the city, it’s almost a sort of CGI performance art in a daft spandex outfit. Good fun. Based on Edgar Rice Burroughs’ Princess of Mars, it stars Taylor Kitsch as John Carter, a confederate cavalryman who has suffered family loss and then gets into conflict with the Apache in 1881. He finds a spider amulet that takes him instantly to Mars or (‘Bharsoom’). There he can exploit its lower gravity so he can jump high. He meets with Tharks, an alien species involved in a struggle with shape shifting Mark Strong and Dominic West. There is a princess of Helium who is under attack from West and Strong. Ciaran Hinds and James Purefoy also uphold the forces of good. Carter has to fight white apes in the arena and helps save Helium against the baddies. The young Edgar Rice Burroughs inherits Carter’s story along with his estate….. The critics have gathered to pan this film and one ought to sympathize. The star, aptly named Taylor Kitsch (sic), is laughably wooden and so is the Princess of Mars, and so are the other big name British actors who ponderously try to out do Brian Blessed’s hamminess in Flash Gordon. Calling the city Helium is asking for trouble, one thinks of squeaky voices. In this film, Mars has two large moons whereas Phobos and Deimos are asteroid size. Visually, the film shows obvious debts to Mad Max, Stargate, Star Wars, and Avatar. The space ships are the usual Dan Dare legoized computer games. For all their alien appearance, the Tharks show human expressions and so do not go beyond the usual anthropomorphism of popular sci-fi. The Tharks look like anorexic turtles with tusk problems, and they are built like basket ball players with four arms. There is the usual predictable noble savage sentimentality of their referring to humans as ugly, so we’re in danger of getting into Dances with Wolves or rather “Dances with Turtles”. However, after acknowledging all that, I do not concur with the critics about the film being overlong and tedious, I enjoyed it, largely because of the Tharks. There is an obvious debt to the aliens in Avatar and there are hints of a better film in the details of Thark life: for instance in the way the small Tharks are hatched and taken in (reminders here of Enemy Mine). If the film could get away from humanizing aliens then we could get more imaginative sci-fi. The desert landscapes are shot in Utah, all toffee coloured rocks in marvellous desert landscapes. Furthermore, for all the bad acting it was fun, like watching a hi-tech She, all Saturday morning matinee thrills. This is where I part company from the critical consensus, its very faults are what makes it likeable. This is after all written by Edgar Rice Burroughs, the author of Tarzan. What do you expect, intelligent dialogue? It’s comic book material, so it’s silly fun. Expecting more would be like expecting Desperate Dan or Dennis the Menace to give us insight into life (though some pompous film critics make those very claims for other comic book japes). This is Beano or Beezer with rayguns and it’s a good larf, so I like it and no, it doesn’t go on too long. The critics are wrong.